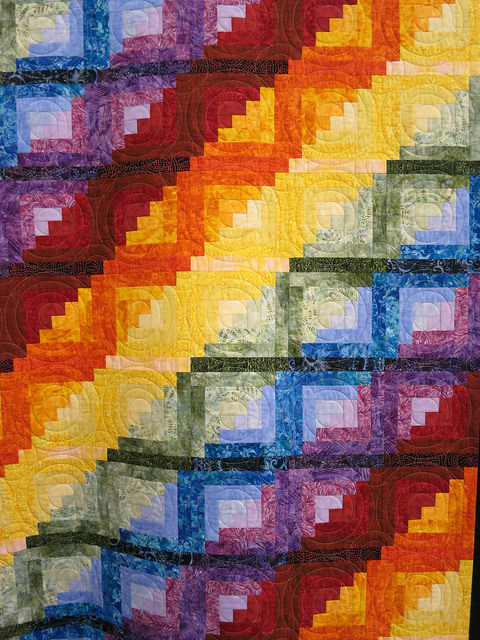 Rainbow Log Cabin by Dorothy Fravel, Keystone Quilters Show 2015. Photo by Wayne Stratz. Another pleasure at the Keystone Quilters 2015 Show was coming across a Rainbow Log Cabin made by Dorothy Fravel. For my kindred spirits in Log Cabin Love, I just finished a Rainbow version of my own the week before, and look forward to sharing it with you. 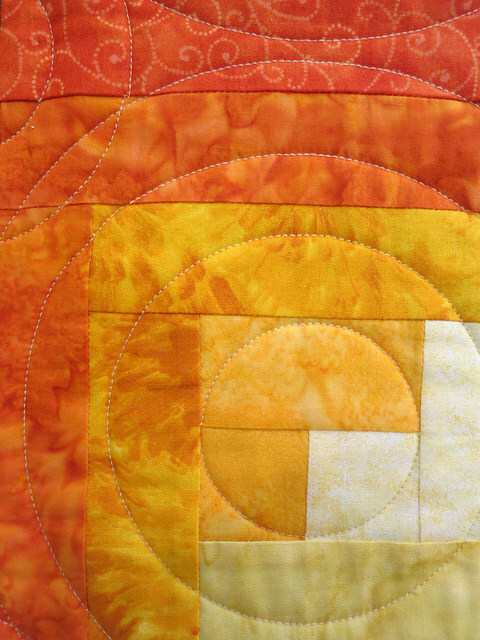 Orange Detail of Rainbow Log Cabin by Dorothy Fravel, Keystone Quilters Show 2015. Photo by Wayne Stratz. 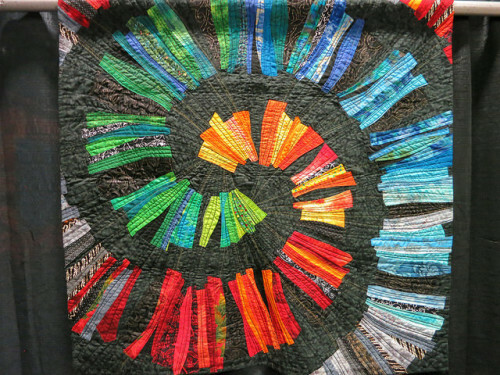 In the Fabric’s Path Quilt by Orna Shahar, Pennsylvania Quilt Extravaganza, XXI, 2014. Photo by Wayne Stratz. In the Fabric’s Path was one of my favorites at the 2014 Pennsylvania Quilt Extravaganza. Orna Shahar belongs to the Israel Quilters Association, and also to Encounters Art Quilt Group, with 16 Israeli quilters who meet to learn from each other, and learn from other art forms such as origami, ceramic, metal, papercutting, and glass. Quilting has been an inspiration to me as a mosaic artist, so it is cool to find quilt artists who explore other art forms. My mind is percolating on how to make a spiral with bundles of vertical lines. 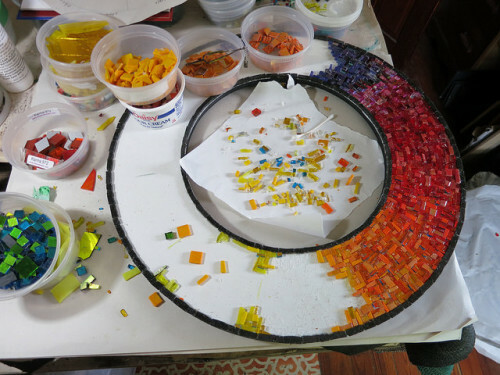 The Red Tail Rainbow Mandala I made in 2011 has a black background. I just had to look up what the name of the shapes I used ~ apparently I am partial to scalene and right-angled triangles and quadrilateral polygons of the kite and trapezoid shapes. In the process I found Paul Calter’s Squaring the Circle: Geometry in Art & Architecture, the chapter on Polygons, Tilings and Sacred Geometry. Looking at the etymology of geometry, it originates from “measurement of earth, ” or Old English “earth-craft.” I imagine the idea of surveying the land in the service of beauty. 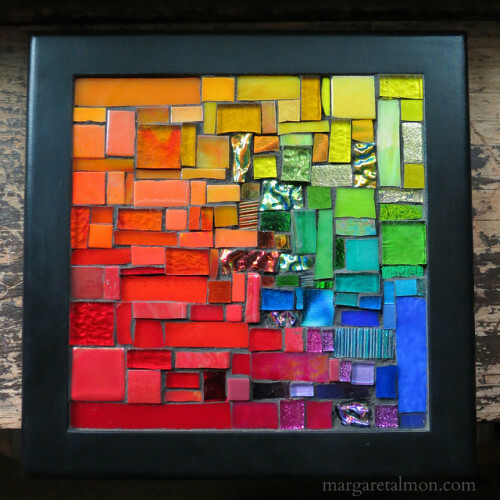 Portable Rainbow by Margaret Almon. 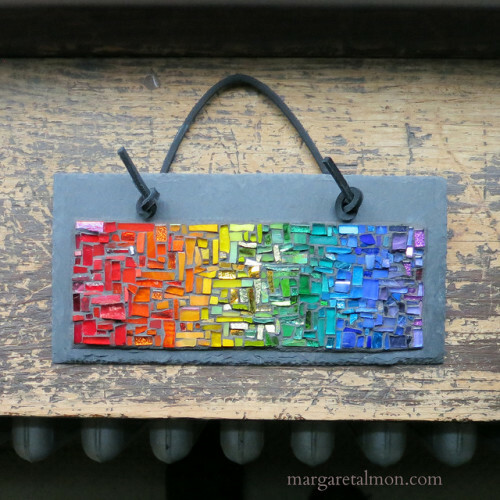 Glass on slate, 4×8 inches, ©2015. I have a compelling desire to create rainbows. I have made many of them in mosaic. Once a woman came into my craft show booth and was smitten with one of my rainbow panels, but said she couldn’t buy it because her husband would be affronted by the gay implications, and gave an awkward shrug. This made me both sad and angry. With the Supreme Court ruling about marriage and gay folk in June, 2015, there is an abundance of rainbows appearing on my Facebook stream, and it’s outburst of talking my rainbow language, and to me this ruling good news, just as God’s love is good news. Rainbow Nametag from Junior High Church Camp, circa 1982. My love of rainbows began at Moravian Church Camp Van Es at Cooking Lake in Alberta. The theme in 1982 was The Rainbow Connection. 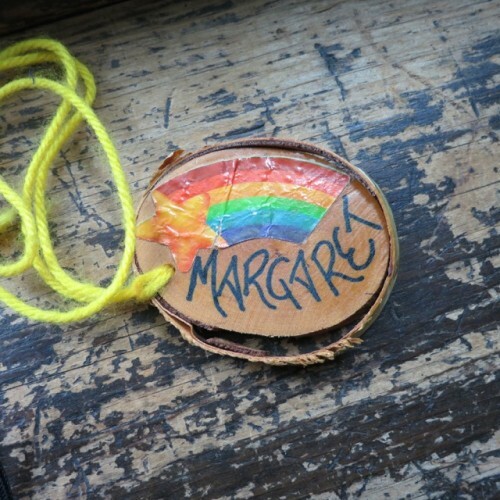 We each had a slice a log, and a volunteer had applied rainbows and written our names. We watched The Muppet Movie with the theme song The Rainbow Connection, and learned the to sing it. We painted a large rainbow backdrop, in an open area in the woods. We memorized Bible verses about the rainbow as a symbol of God’s promise to never again cover the earth in a great flood, a sign of God’s love. What gave it power was the idea that this love extended to me, though I felt flawed through my core, cracked with no method of repair. True grace is a very difficult thing to accept, because the bruised soul assumes it applies to everyone else except her. I took the idea of hope and love to heart. 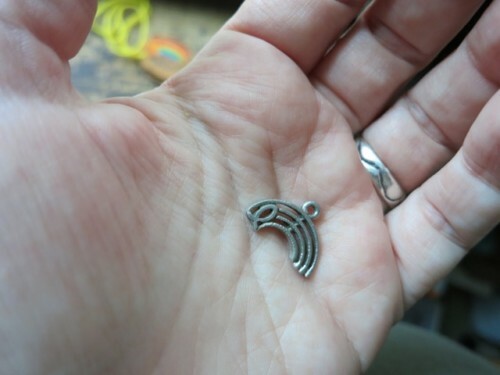 I bought a pewter pendant cast in the form of a rainbow and embedded with an Ichthys fish(a visual pun, an acronym of the Greek letters spelling out Jesus Son of God, which also meant fish). I wore it often, as a way to remain hopeful. Now, some 30 years later, I look at it and wonder at the grayness of this rainbow, and no wonder I feel compelled to create them in full color. For a girl of 14, coming out of a year of depression, the colors were intense. There is power in symbols, but also the power of color itself, the incarnation of beauty. 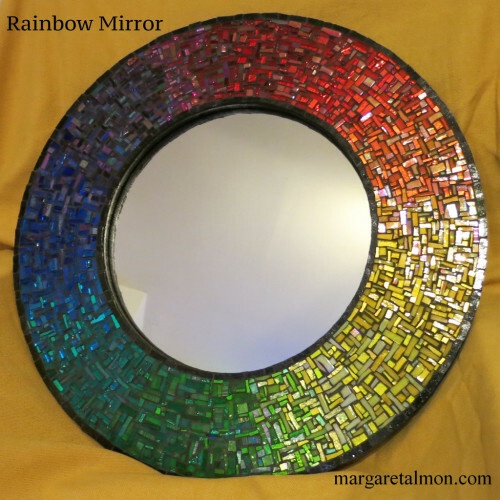 Circular Rainbow Mirror by Margaret Almon of Nutmeg Designs. Glass on MDF, 20 inches. Getting to Orange. 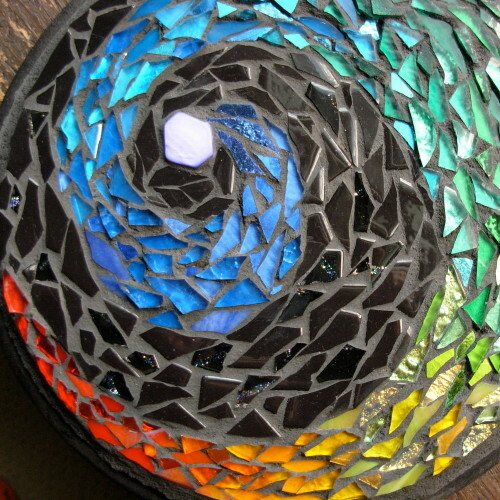 Rainbow Mirror in Progress. Photo by Margaret Almon. Historic Floorcloth by Tracy McCarron. It’s awesome when clients commission something inspired by my previous work, and taking it even further. 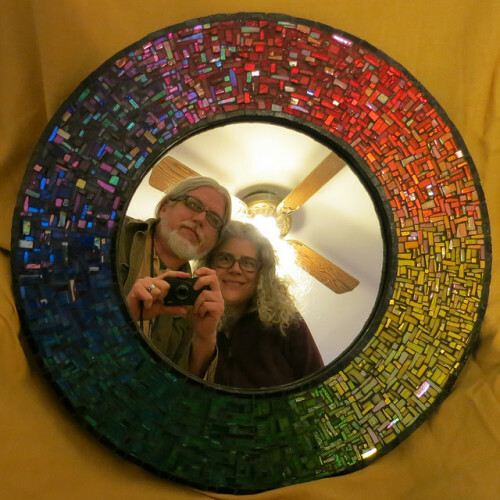 This mirror is 20 inches across, and I started gradating the colors in June, and worked on it a bit at a time, for Christmas delivery. When I got to orange, I had this vision of it taking over half the mirror, but I pulled myself back. More photos to come. Between Orange and Yellow. 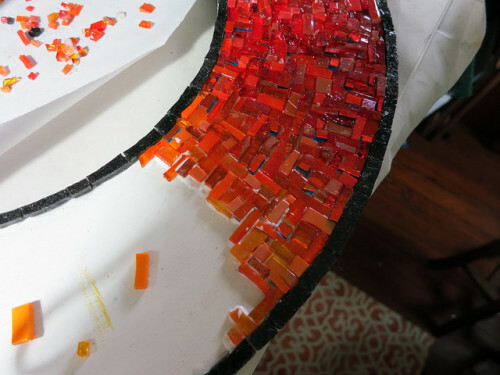 Rainbow Mirror in Process. Photo by Margaret Almon. 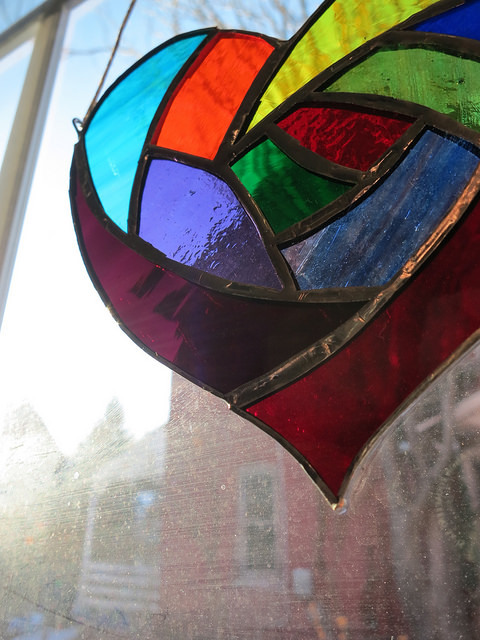 Rainbow Heart Suncatcher by Wayne Stratz. 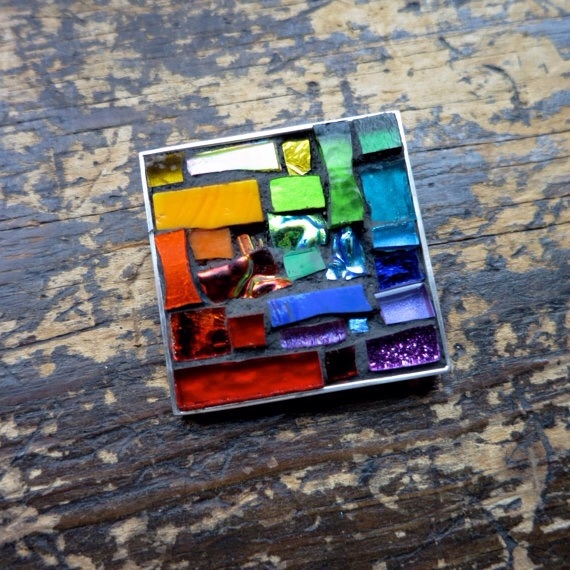 Rainbow Brooch by Margaret Almon. 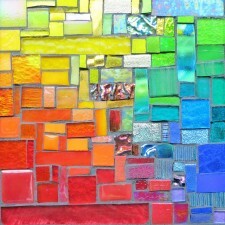 Glass mosaic and silver overlay, 1.4 inch.